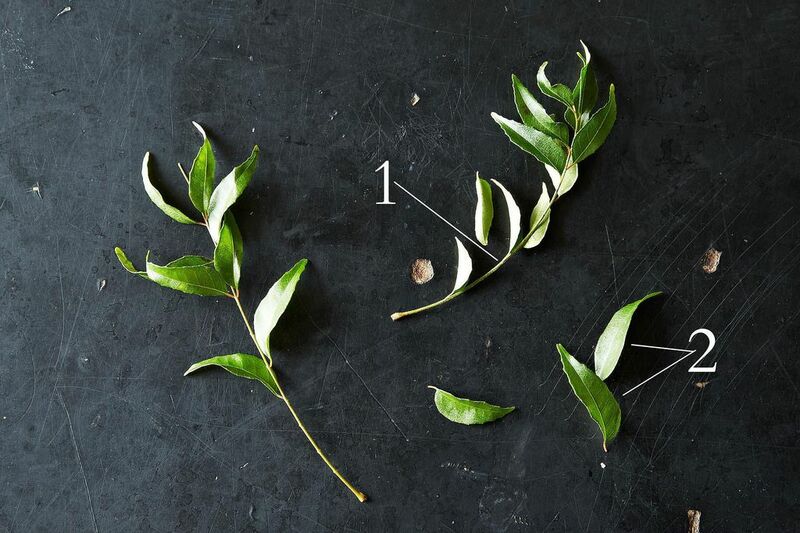 Today: Bring a little green into your kitchen with fresh curry leaves. Spring temperatures not included. Let’s get this out of the way right off the bat. Curry leaves are an herb, and they are not related to curry powder. Curry powder is a blend of different spices which may or (far more likely) may not include curry leaves. In The Oxford Companion to Food, Alan Davidson writes of curry powder: “the kind sold commercially represents an attempt by the British manufactures to provide in ready-made form a spice mixture corresponding to those uses in South India.” Powder and leaves are not, in any way, a substitute for one another. To add to the confusion, curry leaf plants and curry plants are different, too; if you're looking to grow your own curry leaves, the former is what you want. Linguistic sticklers be advised: The curry leaf plant has pinnate leaves (1, below), so when a recipe calls for a certain number of curry leaves, it’s actually calling for said number of curry leaflets (2, below). More: Our friends at Modern Farmer share 5 more plants that are easy to grow at home. So what are they, then? Curry leaves are a part of the same family as citrus fruits. Their glossy green leaves are very aromatic, and they have a unique flavor all their own. There is a citrus element, along with something else that’s hard to put your finger on -- some say asafoetida, and others anise. In her book Classic Indian Cooking, Julie Sahni describes the leaves as having “a bitterish taste and a sweetish, pungent aroma almost like lemon grass." Amanda suggests picking up Maya Kaimal's book Savoring the Spice Coast of India -- "lots of recipes call for curry leaves," and saving some for later by freezing them. When using frozen curry leaves, RobertaJ uses the spine of her chef's knife to "bruise" them a bit first. Pauljoseph has a lot of ideas: "Whole sprigs of fresh curry leaves are often quickly fried (because they can burn in seconds) in ghee or oil with other Indian spices, such as mustard seeds and cumin, and then stirred into any curry. They're delicious with chopped tomatoes or fresh corn kernels. Try grinding the leaves with coconut, chilies, and tamarind to make a chutney." And that's not all he has to share -- multiple community members point to pauljoseph’s recipes as a source for curry leaf cooking inspiration. MaryMaryCulinary says: "I do a lot of South Indian and Sri Lankan cooking, and I am always throwing a sprig into something. However, I buy them in large bags, so I was excited to find this curry leaf sambol recipe as it uses a cup of the leaves. It's delicious with rice and I love it on egg hoppers." After you’ve worked your way through these suggestions and mastered your favorite dal recipe, branch out and try curry leaves in scrambled eggs, bread, or a mojito. Go wild -- it's the weekend, after all. Did we miss your favorite way to use curry leaves? Tell us in the comments! I don't think curry leaves are like asafetida at all! asafetida, while a helpful ingredient, really STINKS! I must keep mine in a ziploc bag, inside another ziploc bag, and then an airtight tupperware container! That might sound like overkill but, if I don't store it that way, I can smell it all over my small apartment! I've been blessed to do a bit of traveling which really expanded my way of thinking from a strictly western mindset. I've learned that it's completely natural to pick some spice items from your meal as you eat. As a spice fanatic, I'm okay with that! I really enjoyed your article! I like your sense of humor! I have a wonderful recipe for garlic braised tomatoes with kari leaves as they area widely known by people from India. I love the flavor and always eat them as opposed to picking them out. Please do tell us your recipe! Please send me what benefits can I get using curry leaves on the hair for growth. would like to know if curry leaves helps grow hair! Add to filling for Masala Dosa! question - chicken soup and beef broth on the stove. I have a bag of curry leaves to use up. can I throw a few leaves into each? would it add anything? or is this not advisable?? still a novice with curry leaves. thanks!! I recently infused curry leaf flavor into canola oil by putting 2 oz. of curry leaf into a cup of oil and heating it to 175F for 2 hours in a water bath. It came out cloudy and and slightly green. The flavor is terrific--we've tried it on potatoes, popcorn, zucchini and swiss chard. I'm thinking curry leaf mayonnaise needs to be tried. 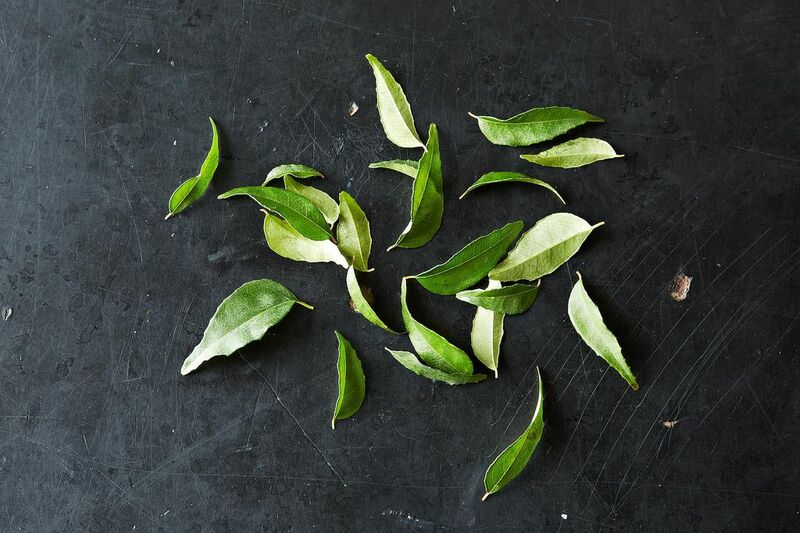 Crush a curry leaf between your fingers and breathe in the slightly spicy, citrus scent. Use the fresh leaves in Indian dishes or to make an aromatic infused olive oil. Fresh curry leaves can be fried in oil to add depth of flavour at the start of cooking, or shredded and added to dishes in the last few minutes. Curry leaves are great with lentils, vegies, fish, coconut, turmeric and mustard seeds in slow-cooked curries, spice mixes and chutney. Dried curry leaves are less pungent than fresh - if using dried, double the quantity. Store curry leaves in a plastic bag in the crisper for up to a week, or in the freezer for up to three months. I bought the stupid curry plant last year hoping to harvest curry leaves. I've never seen the curry leaf plant at the nursery. Maybe I'll search for some seeds. I grew a so called curry herb, had no flavor and was not the curry leaved plant they show in the pics. The dry form of anything fresh is always a poorer substitute, but do you recommend using dry curry leaves if fresh are unavailable? I've used dry curry leaves with a lot of success. The ones I buy are whole, and when crumbled into simmering coconut milk with shallots and lime peel, fragrance it beautifully. Terrific piece. Well explained and love the various 52er suggestions.